A quick note to tell you how much I love your dehydrated cabbage. I nibble on it, but I use it daily in my horse's bucket. As a wonderful result, he no longer has ulcers. You saved his life and I just placed my third order. He received 2 oz daily. Not only was Shayaan malnourished, but he was also prone to ulcers, colic, and other issues. “It is very easy to tell if a horse has ulcers, you just have to run your hand on the flanks and the horse practically shivers. They have a very strong reaction,” she said. Her first response was to go to her veterinarian, who put Shayaan on medication. “I was giving him 30 pills a day” she said, but “he wasn’t getting better.” The symptoms would improve for a while, but he kept getting ill. Barbara told us the “final straw” came when Shayaan had colic three times in 36 hours. “I looked at him and said, we are not doing this anymore!” And that is when Barbara “went on the path of war” looking for a holistic solution. 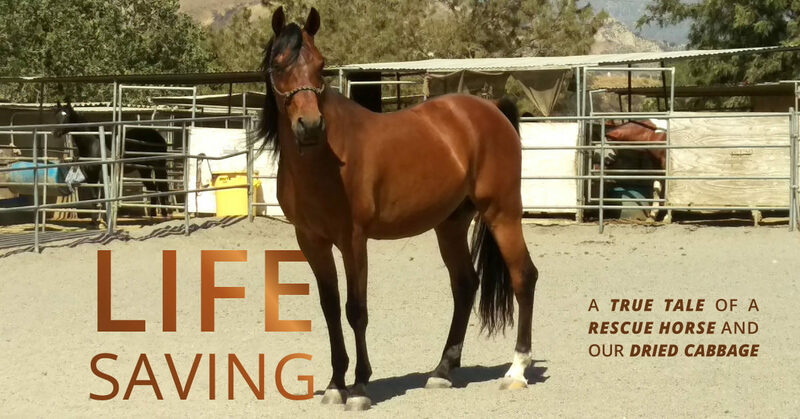 Here at Harmony House, we are honored that our dehydrated cabbage is part of the high quality regimen of care that Barbara offers her horses and we are extremely grateful that Barbara took the time to share Shayaan’s story with us.